Brought to you by of Lifetime Experience Safaris - when it comes to Safari Travel, we know you have a lot of choices. Noisy and curious, intelligent and social, the chimpanzee is the mammal most like a human. Chimpanzees fascinate humans and are favorites both in zoos and the wild. 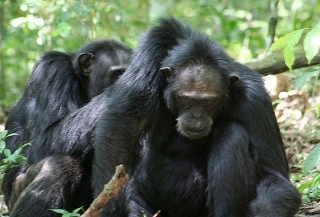 Three subspecies of common chimpanzees are distributed across the forest zone of Africa from Guinea to western Tanzania and Uganda. 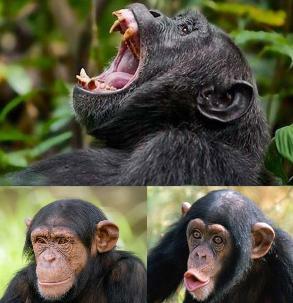 Another species of chimpanzees, the bonobo (Pan paniscus), is found exclusively in central Democratic Republic of Congo. The Ugandan Chimpanzee is a part of the chimpanzees found central and east Africa, Pan Troglodytes Schweinfurthi. 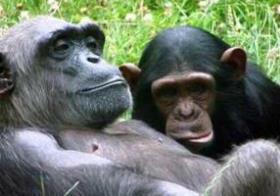 In East Africa the chimpanzee is found in the wild in Uganda and Tanzania, but only in captivity in Kenya. 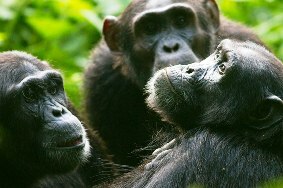 There are over 5000 chimpanzees found in Uganda many of them in National Parks while others are in Wildlife Reserves and other places that they find conducive to their lifestyle. It is said that at one time there 50,000 or more in Uganda, but due to encroachment of villages and settlements, the trapping of chimpanzees, or simply be used for target practice during the civil unrest in Uganda. Chimps are mainly found in rain forests and wet savannas. While they spend equal time on land and in trees, they do most of their feeding and sleeping in trees. In the Parks and the Wildlife Reserves they are protected and there are ongoing research into the habits and nature of chimpanzees. 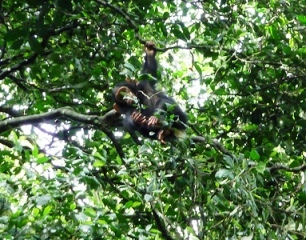 In Uganda, visitor can find chimpanzees places like Kibale Forest National Park, Kyambura Gorge in Queen Elizabeth National Park, Bigodi wetland sanctuary, Kaniyo-Pabidi, Budongo forest in Murchison Falls National park and at the Ngamba Island in Lake Victoria near Entebbe Intenational airport. They are our closest relative in the animal kingdom, 98.9% of the same genes as man. The chimpanzee has a thickset body with long arms, short legs and no tail. Much of the body is covered with long black hair, but the face, ears, fingers and toes are bare. They have hands that can grip firmly, allowing them to pick up objects. The discovery that they used "tools" for certain purposes surprised the world.Chimpanzees though smaller in size than man, are about 5 times stronger. They weigh for males around 150 pounds while females are around 110 to 115 pounds. When they age many of them actually bald somewhat. Chimps sometimes munch leaves to make them absorbent and then use them as a sponge, dipping them in water and sucking out the moisture. They also use grass stems or twigs as tools, poking them into termite or ant nests and eating the insects that cling to them. They are able to wedge nuts between the roots of a tree and break the shells open with a stone. Chimps are diurnal (but often active on moonlit nights) and begin their activities at dawn. After descending from their night nests they hungrily feed on fruits, their principal diet, and on leaves, buds, blossoms, flowers, seeds but have been observed to kills other monkeys. After a while their feeding becomes more selective, and they will choose only the ripest fruit. They usually pick fruit with their hands, but they eat berries and seeds directly off the stem with their lips. Their diet consists of up to 80 different plant foods. Chimps supplement their diets with meat, such as young antelopes or goats. 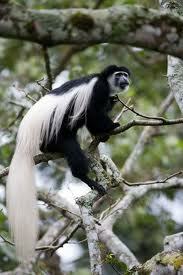 Their most frequent victims, however, are other primates such as young baboons, colobus monkeys and blue monkey. In the Kalinzu Forest in Uganda, researchers have observed them eating red-tailed monkeys. Chimpanzees will use tools such as sticks to gather termites, use rocks to open nuts and other things that would be considered tools. Chimpanzees also use large sticks and branches as clubs and throw them at enemies like leopards and humans. There is no breeding season and females will give birth every 4 to five years. Uganda is the perfect place to see both Chimpanzees and Mountain Gorillas up close. Most Chimpanzees that you will see up close as a visitor to Uganda are habituated, which means that they have become accustomed to be near humans. 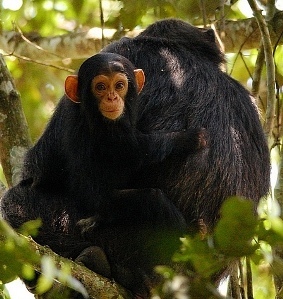 Though it is lower in price to track Chimpanzees, there is still a daily limit and a limit to the size of the group going tracking (trekking). Kyambura Gorge is one Sunken Tropical Forest in the Western Rift Valley hidden, as most people during their time at Queen Elizabeth National Park bypass it and miss the scenic wonder here, unless they have chimpanzee tracking. And I am not sure how many tour operators in Uganda do include it in their itineraries for their visitors,...quite a few of them. Kyambura Gorge, also known as Kyambura Game Reserve, is part of the Queen Elizabeth National Park (QENP) in Uganda. It is home to a variety of wildlife, including the only primates in the Queen Elizabeth National Park. The area is an important water source for many animals and is surrounded by savannah, but is generally noted for its high concentration of primate life located in the gorge. Kyambura Game Reserve was formed to serve as a buffer zone to the Queen Elizabeth National Park. Dry seasons always left much of the park parched, but this beautiful gorge is the much needed oasis for both animals seeking refreshment and for humans, seeking a sight for weary eyes. Water flows from rocks and keeps the gorge green on all time. Rocks that seem to be in various states of tumbling stand out. For Chimpanzees specifically, its a real-life drama. - a family of chimps trapped in this lost world. – they live in a deep and ancient forested gorge that runs though the African savannah and for over fifteen years it has been cut off from the rest of the jungle, leaving them imprisoned. The chimps here face a daily life-or-death dilemma: whether to leave the safety of the gorge and venture into the predator-ridden savannah to find food, or face hunger. There's now less than thirty of them left. A few visitors who tend to have chimpanzee tracking on their safari itinerary and then get the chance to visit Kyambura Gorge, simply get amazed as to what they find here. 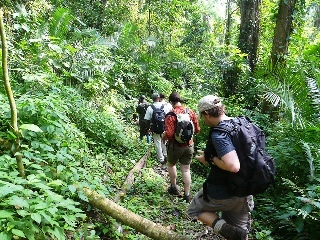 Tracking/trekking the chimps in the Gorge is more physically challenging and therefore is suitable only for reasonably fit people. 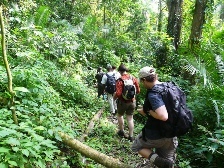 But it is a real rewarding rainforest experience, and the place is just fantastic. Kyambura is located on North-Eastern side of QENP, approximately 30 km from QENP Headquarters. Kyambura Gorge spans a distance of 16km south of Lake George and links to the Kazinga Channel, which forms the northern boundary of the reserve. Village and plantations lie to the south. The reserve's mean altitude is 1100 m.a.s.l. The total area of the reserve is 156 sq. Km. The Visitors’ center is located at the famous Fig Tree Camp on the rim of the Kyambura Gorge, about 2.5 km east of the main road along the turn-off that is clearly marked, some 9km south of the bridge, this road isn’t in great condition but that’s not an issue when you have a 4WD, - getting to QENP as well as this place ideally you need your own vehicle. The gorge has the most incredible views in Uganda, there is also great viewpoint platform from which you can take some great pictures of the Kyambura Gorge surrounded by the Savannah and a rich tropical Forest below. Kyambura is the only place in QENP where you can see habituated Chimpanzees and other primates (about 12) including red-tailed monkey, Black-and-White Colobus, Baboons, Vervet monkeys, Giant Forest Hogs and other mammals. The park is also known for its variety of avian/bird species including various Falcons, the Blue-headed bee-Eater and the African Finfoot and so much more ... it a birders Paradise, not forgetting plenty of Butterflies. 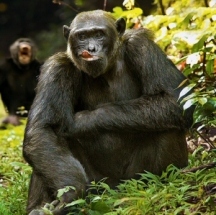 Chimpanzee Tracking at Kyambura Gorge: - "The Valley of Apes", One of the highlights of your trip to Queen Elizabeth Park! Visit the Ngamba Island near Entebbe airport: Have a Close-Up Chimpanzee Encounter - And Make A Difference in the Lives of Chimpanzees! Luxury Safaris in Uganda: Why go on an up-market Safari in Uganda?